Bookit Vacation Rental Manager is a full-featured property management tool designed to help track and manage your vacation rental properties. It automates many tasks and manages your bookings quickly and efficiently in less time with fewer mistakes. You can manage multiple properties in less time than it would normally take to manage just one. Why do you need Bookit to help managing your properties? Ever need to know quickly what dates are available? 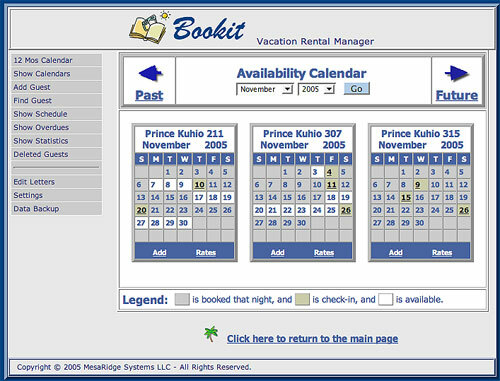 Bookit comes with a built-in availability calendar so yo can see at a glance what dates are available. Ever worry about overlapping or double booking dates? With Bookit you don't have to worry anymore. Check-in and check-out dates are validated to make sure there are no overlaps with existing dates. Ever wish you had better records of your guests? Bookit stores all the guest information and makes it available at your fingertips. You can search to find guest information or scroll through the calendar and select dates to view past guest information. Need help creating an invoice for your guest? Bookit will create an invoice from a template and do the calculations automatically. It will store the invoice on the website in html so the guest can easily access it. Bookit will also send an email to the guest with a link to the invoice. Want to send an email booking confirmation by simply clicking a button? Bookit provides a button on the guest information form that you can click to automatically generate an email to the guest confirming the booking. The email is created from a template you can change before it is sent to the guest. Wish you could keep better track of which guests made their deposit and rental payments?? With Bookit, keeping track of payment is easy. It automatically updates the deposit and payment dates showing receipt when you send the guest notifications. You will always know if you send notifications and the dates that deposits and payments were received. You can also view the notices sent to the guest with a click of a button. Wish you could quickly see which deposits or payments or refunds are overdue? Wish there was an easier way of tracking and managing multiple properties? Bookit can handle multiple properties as easily as a single property. All the properties can be displayed per month in an availability calendar and you can access guest information by clicking on the check-in days for each condo. Ever have a hard time finding the ledger entry for a guest who sent an email or sent a payment or called? With Bookit, you can search for a guest name, and then click on the guest name to open the guest information all in a few seconds. Ever wish you had access to your booking information when away from home? 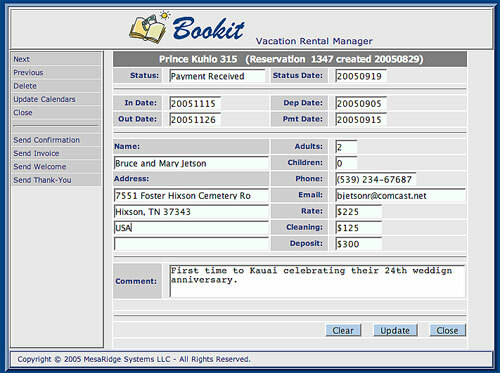 Bookit is online... don't have to install software on your PC or be chained to that PC to manage your bookings. You can manage your bookings on the road from anywhere that you have an internet connection. Wish there was an easy way to quickly get an accurate schedule to your housekeeper?